Allowing subsidy-free renewables to bid for capacity contracts would cut energy bills by £600 million between 2025 and 2035, a new report has found. The analysis by Aurora Energy Research considered the proposals in the recent cost of energy review for an “equivalent firm power” auction. The independent review – commissioned by the government and authored by Oxford economics professor and Aurora director Dieter Helm – called for a capacity auction in which all technologies, renewables included, could bid for contracts on the basis of their contribution to security of supply. Generators would be paid according to their de-rating factors, which would reflect their expected availability during periods when the system is tight and would be influenced by the makeup of the system at the time. They could improve their de-rating factors by contracting backup capacity or deploying co-located storage. The new report by Aurora says designing the auction correctly would be essential to getting the best deal for consumers. If existing subsidised renewables were allowed to enter, the cost to consumers would rise by £400 million between 2025 and 2035 with no gain on terms of security of supply. By contrast, allowing only new unsubsidised renewables to enter would lower costs by £600 million over the same period. The research highlighted the important contribution of wind power to security of supply during the recent “Beast from the East” cold snap, when the load factor of the wind fleet in Great Britain averaged at 69 per cent. Without its presence, the power system would have seen much tighter margins and higher prices. The report also predicted that clearing prices in the existing capacity market are likely to recover in the mid-2020s having reached record-lows of just £6/kW (T-1) and £8.40/kW (T-4) in the latest round of auctions. Aurora identified three key factors that contributed to the collapse in clearing prices – dampened demand, low-cost demand-side response (DSR) and the entry of three new build interconnectors with a combined capacity of almost 2.2GW in the T-4 auction. According to the report, these factors are likely to persist over the next few T-4 auctions for delivery starting in the early 2020s. However, the retirement of significant volumes of coal and nuclear capacity is expected to push prices higher in the mid-2020s as their absence drives the need for new baseload capacity such as combined-cycle gas turbines (CCGTs). The report says the early delivery of new build nuclear power stations, such as Hinkley Point C, would reduce this need. Richard Howard, head of research at Aurora and report co-author, said: “The recent GB capacity auction saw prices driven to unprecedented lows due to falling power demand, and competitive bids by demand response and interconnectors to other power markets. The report additionally notes the impact of lowered de-factors for shorter range batteries on their success in the latest T-4 auction. In the previous auction, all batteries received a de-rating factor of 96 per cent – a figure which Aurora described as “phenomenally high”. This helped them to secure contracts for around 500MW of de-rated capacity. Concerned that some would be unable to meet their obligations during stress events, the Department for Business, Energy and Industrial Strategy lowered the de-rating factors in December for all but the longest duration batteries, thereby reducing the amount they were paid per megawatt of nameplate capacity. The batteries were divided into eight different classes on the basis of their discharge duration. Those in the lowest class (30 minutes plus) received a de-rating factor of around 18 per cent. 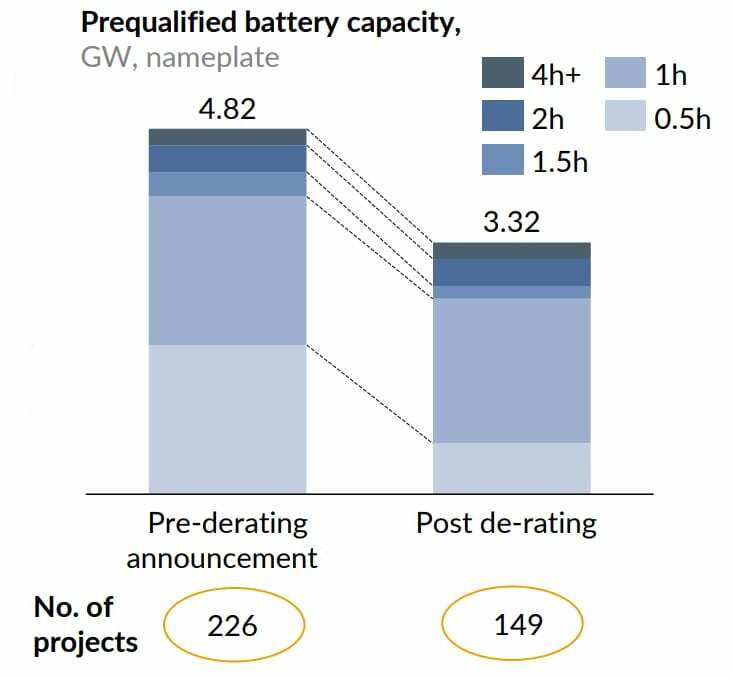 Around 4.8GW of battery capacity (nameplate) pre-qualified for the latest T-4 auction, but the report says 1.5GW withdrew before it took place in response to subsequent reduction in de-rating factors. In the end only 400MW (153MW de-rated) secured an agreement. Where now for energy storage?